Integrating micro-grids and alternative energy sources, providing effective wide area management of transmission and distribution, enabling accurate measurement and control of bi-directional flows, each requires advanced measurement technology as a precondition to the advanced control technologies that are becoming essential to management of the grid – conventional instrument transformers are not up to the task and other optical techniques lack the robustness necessary to the realities of the environment. ​ The ultimate objective is to deliver information rapidly enough that judgments can be made and actions taken within a single cycle – whether for local protective actions or Wide Area Management. The SSC monitoring system already provides information faster than any other measurement technique; SSC plans to improve its performance significantly in the next few years. A revolutionary improvement in the measurement of electric phenomena in the Transmission and sub-Transmission environment. Functions as a AC voltage and current monitor; replacement for CTs and PTs; keystone for effective wide-area-monitoring and management; better building block for syncro-phasor measurement; core element in fault detection and dynamic line rating; more stable and precise metering device. SSC monitoring systems provide combined metering and protection capability – adding “burden” (more devices) does not impact operation. Systems integrate easily into a substation or anywhere in the grid as it exists today, delivering immediate value. The power industry has never before had access to the extremely accurate, highly granular data across an extensive range of frequencies that SSC solutions deliver. Such capability will provide a new opportunity to manage harmonics and other power quality issues that arise from integration of inverter based renewables, variable speed drives, and other modern electronics. The presence of GIC can negatively impact the power system and ultimately lead to grid instability and voltage collapse. 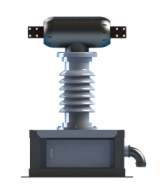 An SSC monitoring system has the capability to measure quasi-DC currents, such as GIC, with high accuracy even at very low magnitudes (0 – 25A). A “GPC” system is installed on the neutral of a wye-connected transformer winding to identify and precisely quantify the DC component present while an “EPC” system is installed on each side of the transformer to identify, quantify and correlate power system effects. This better understanding is required to develop effective GIC mitigation strategies. DLR systems provide estimated real-time capacity of transmission lines to system operators. Often, DLR exceeds the static line rating, allowing operators to keep economic dispatch of generation in place that otherwise would have to be prematurely shut down. However, to capitalize on this additional transmission capacity, the industry and its regulators must have the confidence to dispatch it. SSC monitoring systems provide knowledge of the actual load existing on the transmission system and what part of this load is reactive (VAR monitoring capabilities). Fault locating technologies depend on a database of signatures that indicate power system responses to varying fault conditions. Building such a database requires measurement that is accurate, stable, and therefore repeatable over time. SSC monitoring systems provide repeatability in measurement that will make such systems practical.